Many members of the Latter Day Saint movement claim historical authenticity of the Book of Mormon. Most, but not all, Mormons hold the book's connection to ancient American history as an article of their faith. This view finds no acceptance outside of Mormonism. The theory that the Book of Mormon is an ancient American history is not accepted as scientifically verifiable by the mainstream academic community. Mormon apologists have proposed multiple theories to explain apparent inconsistencies with the archaeological, genetic, linguistic and other records. The Book of Mormon purports to give an account of two civilizations formed by families who migrated to the Americas. One group of families came from Jerusalem in 600 BC and afterward separated into two nations, known as the Nephites and the Lamanites. Another group came much earlier, when God confounded the tongues at the Tower of Babel; that group is known as the Jaredites. After thousands of years, all were destroyed except the Lamanites. Latter Day Saints claim that Lamanites are among the ancestors of the Native Americans. The dominant and widely accepted view among Latter Day Saints is that the Book of Mormon is a true and accurate account of these ancient American civilizations whose religious history it documents. Joseph Smith, whom most Latter Day Saints believe to have translated the work, stated, "I told the brethren that the Book of Mormon was the most correct of any book on earth, and the keystone of our religion, and a man would get nearer to God by abiding by its precepts, than by any other book." Unresolved issues of the book's historicity and the lack of supporting archaeological evidence have led some adherents to adopt the position that the Book of Mormon may have been the creation of Smith, but that it was nevertheless divinely inspired. Between these two views is the view held by some Latter Day Saints that the Book of Mormon is a divine work of a spiritual nature, written in ancient America, but that its purpose is to teach of Christ and not to be used as a guide for history, geology, archaeology, or anthropology. Discussion regarding the historicity of the Book of Mormon often focuses on archaeological issues, some of which relate to the large size and the long time span of the civilizations mentioned in the book. A contemporary Mormon view is that these civilizations rose and fell in Mesoamerica. Civilizations of their magnitude and duration would be expected to leave extensive archaeological records. Several Mesoamerican civilizations did exist in the time period covered by the Book of Mormon, including the Olmec, Zapotec and Maya. The Olmec and Zapotec civilizations developed a writing system that may have served as the model for the later Mayan writing system, which became highly developed. The Maya developed a complex calendar and were advanced in astronomy and mathematics. Adherents of the Latter Day Saint movement give varied responses to these criticisms. Some point to what they claim is evidence for the presence of these items and locations. [clarification needed] Others invoke the limited geography model, regarding the events of the Book of Mormon as taking place in such a geographically limited area that no evidence should be expected. Some counter that the words used in the Book of Mormon refer not to the animals, plants and technologies that presently exist but to other similar items that did exist at the time. These views are not directly supported by the LDS Church, but they do motivate archaeological efforts to further understand these situations, including research being performed by Brigham Young University (BYU) professors. In 1955, Thomas Ferguson, a Latter Day Saint and the founder of the New World Archaeological Foundation (NWAF), with five years of funding from The Church of Jesus Christ of Latter-day Saints (LDS Church), began to dig throughout Mesoamerica for evidence of the veracity of the Book of Mormon claims. In a 1961 newsletter, Ferguson predicted that although nothing had been found, the Book of Mormon cities would be found within ten years. In 1972, Christian scholar Hal Hougey wrote to Ferguson questioning the progress made, given the stated timetable in which the cities would be found. Replying to Hougey as well as secular and non-secular requests, Ferguson wrote in a letter dated June 5, 1972: "Ten years have passed . ... I had sincerely hoped that Book-of-Mormon cities would be positively identified within 10 years—and time has proved me wrong in my anticipation." During the period of 1959–61, NWAF colleague Dee Green was editor of the BYU Archaeological Society Newsletter and had an article from it published in the summer of 1969 edition of Dialogue: A Journal of Mormon Thought, pp 76–78 in which he acknowledged that the NWAF findings did not back up the veracity of the Book of Mormon claims. After this article and another six years of fruitless search, Ferguson published a 29-page paper in 1975 entitled, "Written Symposium on Book-of-Mormon Geography: Response of Thomas S. Ferguson to the Norman & Sorenson Papers" in which he concluded, "I'm afraid that up to this point, I must agree with Dee Green, who has told us that to date there is no Book-of-Mormon geography". Referring to his own paper, Ferguson wrote a 1976 letter in which he stated: "The real implication of the paper is that you can't set the Book-of-Mormon geography down anywhere—because it is fictional and will never meet the requirements of the dirt-archeology. I should say—what is in the ground will never conform to what is in the book." The archaeological investigations of NWAF-sponsored projects have contributed towards the documentation and understanding of pre-Columbian societies, particularly in Mesoamerica. Currently, BYU maintains 86 documents on the work of the NWAF at the BYU NWAF website and these documents are used outside both BYU and the LDS Church by researchers. An additional criticism of the historical authenticity of the Book of Mormon concerns linguistics. According to the text, the Nephites and the Lamanites initially spoke Hebrew (600 BC) and might have spoken a modified Semitic language until at least 400 AD, when the Book of Mormon ends. The non-canonized introductory paragraph to the LDS Church 1981 edition of the Book of Mormon stated that the Lamanites were the "principal ancestors of the American Indians". No Semitic language is spoken natively in the Americas today, however, and there is no evidence that any Native American language has been influenced by any Semitic language at any point in its history. Historical linguists who specialize in the languages of Native America are in agreement that the languages of Native America cannot be proven to be related to each other within the last eight to ten thousand years, let alone within the last thousand. A common counterargument is that the Book of Mormon mentions contact with other civilizations that might have had their own non-Semitic languages that influenced or supplanted any Semitic language being spoken. Apologists[which?] point out that the introduction merely stated that the peoples mentioned in the Book of Mormon are the primary ancestors of the Native Americans; it did not claim that they are the sole ancestors. The "Anthon Transcript" is a small piece of paper on which Joseph Smith wrote several lines of characters. According to Smith, these characters were from the golden plates (the ancient record from which Smith claims to have translated the Book of Mormon) and represent the reformed Egyptian writing that was on the plates. This paper was then delivered to professor Charles Anthon, a well-known classical scholar of Columbia College, Columbia University, for an expert opinion on the authenticity of the characters and the translation. Adherents to the Book of Mormon claim that Anthon attested to the characters' authenticity in writing to Martin Harris but then ripped up his certification after hearing the story of Smith and the plates. Critics, and Anthon himself, claim that Anthon believed any idea of reformed Egyptian was a hoax all along and that Harris was being duped. Anthon's own accounts differ, however: in his first he states that he refused to give his opinion at all; in the second he declares that he gave his opinion "without any hesitation" with intent to expose the transcript as a fraud. The Book of Mormon tells of the people of Jared, consisting of several families from the Tower of Babel, who migrated to America from the Old World before Abraham's time; a group including Lehi's family who migrated to America from Jerusalem around 600 BC; and another group (the people of Mulek) who migrated to America from Jerusalem about eight years later. Although the Book of Mormon makes no overt assertions regarding the migration or non-migration of other groups to America, an introductory paragraph added to the 1981 edition identifies the Lamanites as the "principal ancestors of the American Indians." In 2007, this statement was changed to "among the ancestors". North American Indians are generally considered the genetic descendants of East Eurasian peoples. Several authors have published works that suggest that current studies of genetic anthropology using DNA evidence do not provide support for the Book of Mormon. To date there have been DNA studies that link any Native American group with West Eurasia. Some Mormon researchers claim that it is not valid to use genetics to attempt to prove or disprove the historicity of the Book of Mormon, citing a lack of source genes and the improbability of tracing Israelite DNA even if present. The Smithsonian Institution issues a standard reply to requests for their opinion regarding the Book of Mormon as an archaeological or scientific guide. Prior to 1998, the statement denied any evidence for pre-Columbian contact between Old and New Worlds: "Certainly there was no contact with the ancient Egyptians, Hebrews or other peoples of Western Asia or the Near East." In 1998, the Smithsonian began issuing a shorter letter without the detailed response found in the first letter, and limited its comment to briefly deny any use of the Book of Mormon as an archaeological guide by the institution. [C]ould the people of Mulek and of Lehi ... part of the time numbering and occupying the land at least from Yucatan to Cumorah ... live and move and have their being in the land of America and not come in contact with other races and tribes of men, if such existed in the New World within Book of Mormon times? To make this seem possible the area occupied by the Nephites and Lamanites would have to be extremely limited, much more limited, I fear, than the Book of Mormon would admit our assuming. The cities mentioned in the Book of Mormon have not been identified. Several groups of Mormon scholars and apologists, including the Foundation for Apologetic Information & Research (FAIR) and the Foundation for Ancient Research and Mormon Studies (FARMS), have proposed that the city Zarahemla is located somewhere within Central America because of the description given in Alma 22:27 as a narrow neck of land bordering sea on the west and on the east. This approach, often referred to as the "Limited Geography Model," argues for a more limited view of the Book of Mormon, suggesting that the book is a history of only a small group of Native Americans in Central America. This theory has been gaining substantial support among LDS scholars since the mid-1980s because it more accurately represents the descriptions given within the text itself. For instance, the populations and civilizations described in the Book of Mormon were likely too small (only a few million) to fill entire continents; moreover, there is much evidence that one common assumption of the past—that Book of Mormon civilizations were alone in America—is probably incorrect. Most LDS authors hold the belief that the Book of Mormon events took place within a limited region in Mesoamerica, and that others were present on the continent at the time of Lehi's arrival. This geographical and population model was formally published in an official church magazine, Ensign, in a two-part series by John L. Sorenson published in September and October 1984. This was followed by a book on the subject by Sorenson in 1985. The Gospel Topics essays section of the LDS official website hosts two essays entitled "Book of Mormon and DNA Studies" and "Book of Mormon Translation". These are some of the few official Church statements with regard to such historical issues. ^ See, for example, James E. Faust, "The Keystone of Our Religion," Ensign, January 2004, p. 3. ^ Fagan, Garrett G.; Feder, Kenneth L. (1 December 2006). "Crusading against straw men: an alternative view of alternative archaeologies: response to Holtorf (2005)". World Archaeology. 38 (4): 718–729. doi:10.1080/00438240600963528. ^ a b c The original 1830 edition of the Book of Mormon does not make this claim. 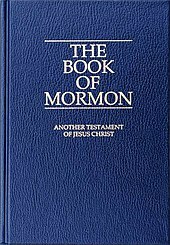 In 2007, the introduction to the Book of Mormon was changed to state that the Lamanites are "among the ancestors of the American Indians." The 1981 edition of the Book of Mormon states that the Lamanites are "the principal ancestors of American Indians." ^ Lyle Campbell. 1997. American Indian Languages: The Historical Linguistics of Native America. Oxford University Press. ; Ives Goddard. 1996. "Introduction," Handbook of North American Indians, Volume 17, Languages. Ed. Ives Goddard. Washington: Smithsonian Institution; Marianne Mithun. 1999. The Languages of Native North America. Cambridge University Press. ^ Smith, Joseph. Joseph Smith–History. LDS Church. Retrieved 2009-11-29. See also: Joseph Smith–History. ^ Eber D. Howe (1834). "Chapter XVIII". Mormonism Unvailed. Painesville, Ohio: Telegraph Press. pp. 269–273. ^ Richard L. Bushman, Joseph Smith: Rough Stone Rolling (New York: Knopf, 2005), 65-66. ^ Bushman, Richard (2005). Joseph Smith: Rough Stone Rolling. Knopf. pp. 65–66. ISBN 978-1-4000-4270-8. ^ Jen Viegas,“A Previously Unknown Group of Ancient Native Americans Was Just Revealed” “Seeker”, January 3, 2018, Retrieved 2019-04-01. ^ Raghavan; et al. (21 August 2015). "Genomic evidence for the Pleistocene and recent population history of Native Americans" (pdf). Science. 349 (6250): aab3884. doi:10.1126/science.aab3884. PMC 4733658. PMID 26198033. Retrieved 1 April 2019. ^ One of the more vocal challengers to the DNA vs. The Book of Mormon issue is Dr. Thomas W. Murphy. ^ Geneticists have noted the difficulties in using genetics in this area for a variety of reasons. Some of these are our lack of knowledge concerning Sariah's descent (or others' in Lehi's party), have access to DNA from this period (600 BC Israel), or know what other groups would have intermarried with these groups (or in what numbers). For more information see Whiting, Michael F (2003). "DNA and the Book of Mormon: A Phylogenetic Perspective". Journal of Book of Mormon Studies. 12 (1): 24–35. Retrieved 2007-01-19. ^ Not having the ancient Israelite genes for comparison and the inability for DNA testing to link some Jewish groups that are known to be related, see Butler, John M (2006). "Addressing Questions surrounding the Book of Mormon and DNA Research". FARMS Review. 18 (1): 101–108. Retrieved 2007-01-19. .
^ Sorenson, John L (September 1984). "Digging into the Book of Mormon: Our Changing Understanding of Ancient America and Its Scripture (Part 1)". Ensign: 27. Retrieved 2011-10-19. Sorenson, John L (October 1984). "Digging into the Book of Mormon: Our Changing Understanding of Ancient America and Its Scripture, Part 2". Ensign. Retrieved 2011-10-19. ^ "Book of Mormon and DNA Studies"
^ "Book of Mormon Translation." Brewster, Quinn (1996), "The Structure of the Book of Mormon: A Theory of Evolutionary Development" (PDF), Dialogue: A Journal of Mormon Thought, 29 (2): 109–140 . Brodie, Fawn M (1971), No Man Knows My History, New York: Knopf, ISBN 978-0-679-73054-5 . Dunn, Scott C (May 2002), Vogel, Dan; Metcalf, Brent Lee, eds., "Automaticity and the Dictation of the Book of Mormon", American Apocrypha: Essays on the Book of Mormon, Salt Lake City, Utah: Signature Books: 17–46, ISBN 978-1-56085-151-6 . Faulring, Scott H (June 2000), "The Return of Oliver Cowdery", The Disciple as Witness: Essays on Latter-day Saint History and Doctrine in Honor of Richard Lloyd Anderson, Provo, Utah, archived from the original on 2007-10-13, retrieved 2007-05-19 . Givens, Terryl (2002), By the Hand of Mormon: The American Scripture That Launched a New World Religion, Oxford University Press, ISBN 978-0-19-516888-4 . Mauss, Armand L (2003), All Abraham's Children: Changing Mormon Conceptions of Race and Lineage, Illinois: University of Illinois Press, ISBN 978-0-252-02803-8 . Metcalfe, Brent Lee (1993). "Apologetic and Critical Assumptions about Book of Mormon Historicity". Dialogue: A Journal of Mormon Thought. 26 (3): 153–84. Archived from the original on 2009-02-10. .
Midgley, Louis C (1997), Reynolds, Noel B, ed., "Who Really Wrote the Book of Mormon? : The Critics and Their Theories", Book of Mormon Authorship Revisited: The Evidence for Ancient Origins, Provo, Utah: Foundation for Ancient Research and Mormon Studies: 101–139, ISBN 978-0-934893-25-1 . Murphy, Thomas (2003), "Simply Implausible: DNA and a Mesoamerican Setting for the Book of Mormon", Dialogue: A Journal of Mormon Thought, 36 (4): 109–131, SSRN 2177709 . Murphy, Thomas (2003), Imagining Lamanites: Native Americans and the Book of Mormon, Seattle: University of Washington, SSRN 2177734 . Murphy, Thomas (2004), "Sin, Skin, and Seed: Mistakes of Men in the Book of Mormon", Journal of the John Whitmer Historical Association, 25: 36–51, SSRN 2177700 . Persuitte, David (October 2000), Joseph Smith and the Origins of The Book of Mormon (second ed. ), McFarland & Company, ISBN 978-0-7864-0826-9 . Roberts, Brigham H (1985), Brigham D. Madsen, ed., Studies of the Book of Mormon, Urbana, Illinois: University of Illinois Press, ISBN 978-0-252-01043-9 . Shipps, Jan (1982), "An 'Insider-Outsider' in Zion" (PDF), Dialogue: A Journal of Mormon Thought, 15 (1) . Skousen, Royal (May 2001), "The Original Manuscript of the Book of Mormon: Typographical Facsimile of the Extant Text", Book of Mormon Critical Text Project, Provo, Utah: Foundation for Ancient Research and Mormon Studies, 1, ISBN 978-0-934893-04-6 . Skousen, Royal (January 2001), "The Printer's Manuscript of the Book of Mormon : typographical facsimile of the entire text in two parts", Book of Mormon Critical Text Project, Provo, Utah: Foundation for Ancient Research and Mormon Studies, Brigham Young University, 2 (1), ISBN 978-0-934893-05-3 . Skousen, Royal (March 2001), "The Printer's Manuscript of the Book of Mormon : typographical facsimile of the entire text in two parts", Book of Mormon Critical Text Project, Provo, Utah: Foundation for Ancient Research and Mormon Studies, Brigham Young University, 2 (2), ISBN 978-0-934893-06-0 . Skousen, Royal (2004), "Analysis of Textual Variants of the Book of Mormon", Book of Mormon Critical Text Project, Provo, Utah: Foundation for Ancient Research and Mormon Studies, Brigham Young University, 4 (1), ISBN 978-0-934893-07-7 . Skousen, Royal Skousen (2005), "Analysis of Textual Variants of the Book of Mormon", Book of Mormon Critical Text Project, Provo, Utah: Foundation for Ancient Research and Mormon Studies, Brigham Young University, 4 (2), ISBN 978-0-934893-08-4 . Skousen, Royal (2006), "Analysis of Textual Variants of the Book of Mormon", Book of Mormon Critical Text Project, Provo, Utah: Foundation for Ancient Research and Mormon Studies, Brigham Young University, 4 (3), ISBN 978-0-934893-11-4 . Smith, James E (1997), Noel B. Reynolds, ed., "How Many Nephites? : The Book of Mormon at the Bar of Demography", Book of Mormon Authorship Revisited, Deseret Book Company and Foundation for Ancient Research and Mormon Studies, ISBN 978-0-934893-25-1 . Sorenson, John L (1985), An Ancient American Setting for the Book of Mormon, Salt Lake City, Utah: Deseret Book and The Foundation for Ancient Research and Mormon Studies, ISBN 978-0-87747-608-5 . Southerton, Simon G (2004), Losing a Lost Tribe: Native Americans, DNA and the Mormon Church, Salt Lake City: Signature Books, ISBN 978-1-56085-181-3 . Spaulding, Solomon (1996), Reeve, Rex C, ed., Manuscript Found: The Complete Original "Spaulding" Manuscript, Provo, Utah: Religious Studies Center, Brigham Young University . Tvedtnes, John A (1984), "Isaiah Variants in the Book of Mormon", Featured Papers, Provo, Utah, archived from the original on 2007-04-08, retrieved 2007-04-16 . Vogel, Dan (2004), Joseph Smith: The Making of a Prophet, Salt Lake City: Signature Books, ISBN 978-1-56085-179-0 . FairMormon specializes in Mormon apologetics. It has no official connection to the church. This page was last edited on 1 April 2019, at 16:46 (UTC).